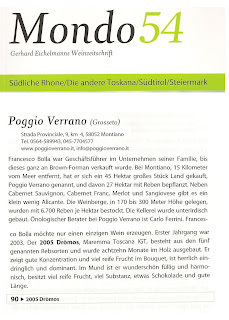 Here it is a summary of the positive review about Dròmos 2005 by Gerhard Eichelmann in the German magazine MONDO: "… in the bouquet it shows a good concentration and a lot of ripe fruit; it is powerful and outstanding. In the mouth it is excellently rich and harmonious, with ripe fruit, a lot of substance, some chocolate and very persistent. 90"